Sunday, November 14, 2010 — Today the Boston auction house of Skinner, Inc. will sell to the highest bidder an original copy of the Declaration of Independence, printed in Exeter, New Hampshire in 1776 by Robert Luist Fowle. Skinner’s appraiser for this item, Sara Wishart, estimates that it will bring between $300,000 and $500,000. 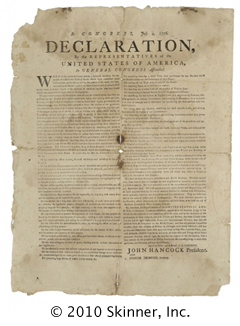 Another copy of the Declaration printed by Fowle went for $390,750 at Sotheby’s ten years ago. We lavish space on this story partly because of its intrinsic interest and partly because it gives us an excuse to tell, once again, the story of the man who printed it, Robert Luist Fowle. Robert Luist Fowle (1743 – 1802?) was a nephew and apprentice of Daniel Fowle, the founder of this newspaper. Robert became Daniel’s business partner in 1764, an arrangement that continued for about ten years, after which Robert moved to Exeter where he established his own print shop. The two parted ways over political differences. The press on which Robert printed the Declaration is on display at the Exeter Historical Society. Built in England around 1740, it is one of only a handful of 18th century wooden common presses known to exist in this country. The Exeter Historical Society is located at 47 Front Street and is open to the public on Tuesdays and Thursdays from 2 to 4:30 p.m. and Saturdays from 9:30 a.m. to noon. For more information call (603) 778-2335. * The first printing of the Declaration was done in Philadelphia the night of July 4th by John Dunlap, official printer of the Continental Congress. A copy of the Dunlap Broadside was discovered in 1968, in a previously overlooked crate found in a bookstore that was about to close. It was sold to a private party, Ira G. Corn, Jr., in 1969, for $404,000 ($2,337,660 in today’s money). The document is now on display at the Dallas Public Library. † Robert Luist Fowle, first child of John Fowle, Daniel Fowle’s eldest brother, did not fall far from the tree. Though educated at Harvard (Class of 1732), John’s career was less than stellar. Dismissed as Pastor of the Church of Christ in Hingham in 1746 “because of mental derangement,” he was later assigned by the Society for the Propagation of the Gospel in Foreign Parts to St. Paul’s Episcopal Church in Norwalk, Connecticut. John was dismissed from that position in 1756 for selling the mission library. He is thought to have gambled away the money. By 1761, John was reduced to working as a scrivener in Portsmouth. He later returned to Boston, where he was imprisoned for debt and died in jail. Posted: November 14th, 2010 under Uncategorized. Very very interesting stuff. Thank you for the article.